This is my second post on great baby bath buys, because as Ivo’s grown, he’s needed different toys! My first list is perfect for newborns – this one is an upgrade for your 6-12 month old babies. We still use everything on the first list – the Mamas & Papas Acqua Ergo Bath has proven completely indispensable. Ivo’s probably old enough to be in the big bath now, but he’s so naughty at standing up, that I prefer to contain him slightly. All his bath toys are now aimed at distracting him from trying to escape – it’s not that he doesn’t like his baths – he just doesn’t see them as chill-out time! 1. 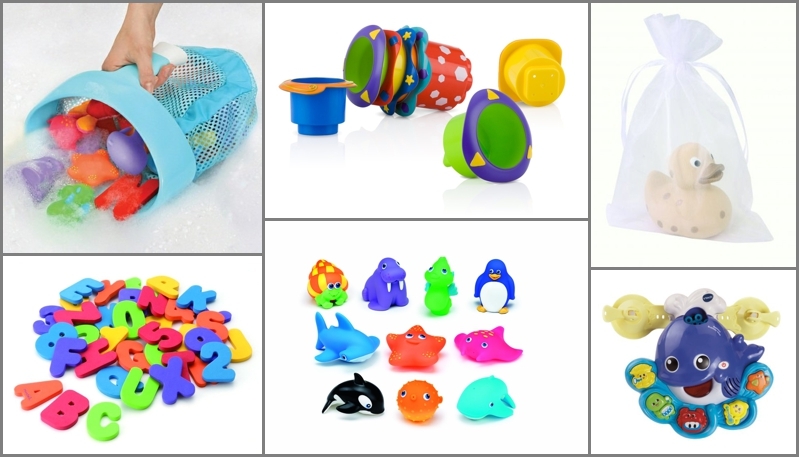 Brica Super Scoop, £14 – Great bath-toy storage! You can scoop all the toys up easily, and the net means they drip dry super-quickly, and don’t get mildew. The net suckers to the wall for neat storage. 2. Nuby Splish Splash Stacking Cups, £4.31 – For water movement! These brightly coloured cups have holes in the bottom, and when we make mini-showers, Ivo tries to grab the water, or even drink it! 3. Natural Rubber Cuddleduck, £5.99 – Ivo loves to gum this duck, and sink it under the water to watch it bob back up. 4. VTech Baby Bathtime Bubbles Whale, £19.99 – Recommended by my friend Alice from the lifestyle blog Bootique – this bubble toy keeps Ivo distracted from standing up. 5. Munchkin Squirtin Sea Buddies (Pack of 10), £7.50 – I love these toys! They’re super-cute, and really unusual animals – puffer fish anyone? Ivo loves chewing on them, and squishing them so the water spurts out. 6. Munchkin Bath Letters and Numbers, £7.96 – My friend’s 18 month old baby can already name her letters thanks to these! Ivo’s not that advanced yet…..